There is parking space for about 6 cars. Parking is free of charge. Are there any convenience stores near the guesthouse? There is one nearby, but it's not open 24/7. What transports are there to the guesthouse? Call us and we'll come to pick you up. Taxi arrangements are also possible. Could you arrange for a taxi? Is there a rental cycle availible? Yes, you can rent it for free. Can I use a washing machine? Is there a fee? A washing machine is available for a fee. The whole building is a non-smoking property, so you'll have to take it outside, or to the veranda on the second floor. Sorry, currently we accept payment in cash only (unless you book and pay using Airbnb). No preexisting group discounts. It may be negotiable depending on circumstances. Is there any discounts for students/children? Senior High school students: JPY 2000. Elementary and Junior High school students: JPY 1800. Children are JPY 1000 but if no extra bed/futon is needed (infants) then there is no fee. What happends if I need to cancel a reservation? If you cancel at least one day before the reserved date(s) then their are no cancellation fees or charges. If you cancel later than one day before the reserved date, we will charge you for half the amount. Please keep this in mind and be careful! Please contact us by phone or email. 090-8407-8500 or 0997-63-9006 or send a message using the booking/contact form on the front page. Do you charge differently for Internet reservation / Phone booking? Please let us know if you are seeing something else. Different services uses different methods to exclude/include fees, so if there is a mistake somewhere we'll try to correct it. What is the latest I can make a reservation? Depending on availability, you can make a reservation even the same day. How far ahead of time can I make a reservation? Is there any kitchen space available to use? 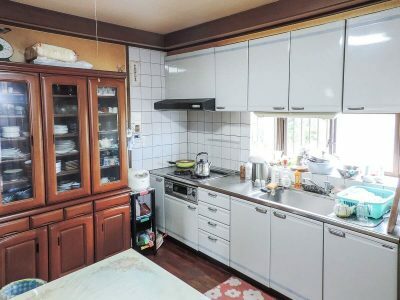 There is a shared kitchen space (A traditional japanese style home kitchen). You can use any existing utensils free of charge.